This is just a fun card that I made for Summer Card Camp 2 and the Color Throw Down Challenge. I used a mixture of Papertrey Ink cardstock and Stampin' Up cardstock. The stamps were picked up in the dollar bin at Michael's. Hope you enjoy!! Happy Hump Day! I love your card. Glad to hear you are a dollar bin shopper, I am too. I also love martinis! I like the circles on the banner. Nice design! I like what you've done with the circles. Very nice! Great texture and very fun design! How cute!! i love the circles with the drinks. Such a fun card!! How fun! It's perfect for a celebration. Thanks for joining us for the CTD's anniversary celebration! This is sooo cute and fun...it's such a wonderful design!!! 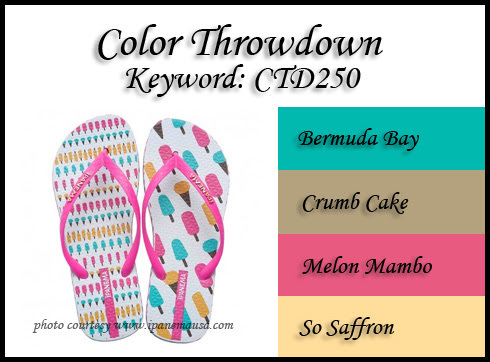 Thanks for playing along with the Color Throwdown's anniversary celebration!!! !